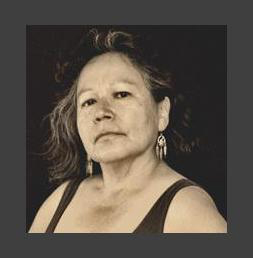 Shelley Niro is a member of the Turtle Clan of the Kanien’kehaka (Mohawk) Nation, from the Six Nations of the Grand River territory, near Brantford, Ontario. She creates complex visual experiences in a variety of media, including beadwork, painting, photography and film. Her work has been exhibited widely, both nationally and internationally, and she has received considerable attention for her films. Niro is known for incisively challenging conventional, colonial representations of Aboriginality with directness and humour. She crafts and retells indigenous narratives by drawing on lived experienced as well as themes of identity, self-determination and liberation. Her short film The Shirt, was presented at the 2003 Venice Biennale and the 2004 Sundance Film Festival. In 2009, her first feature film, Kissed by Lightning, premiered at Toronto’s imagineNATIVE Film + Media Arts Festival and won the Santa Fe Film Festival’s 2009 Milagro Award for Best Indigenous Film. Niro’s works of art can be found in the collections of Galleries and Museums across Canada. Niro studied at the Banff School of Fine Arts, is a graduate of OCAD University and received her MFA from the University of Western Ontario.